Chris Iannetta, C: Now 33 years of age, Iannetta has turned in two straight marginal campaigns with the bat. But he hit .238/.357/.386 in over 1,000 plate appearances from 2012 through 2014, with 151 walks to go with 251 strikeouts. Iannetta still draws free passes at a hefty clip, but suffered from low BABIPs in each of the last two seasons (.225, .266). Though he’s making more soft contact than he did at his best, Iannetta turned in a 34.9% hard-contact rate and 22.4% line-drive rate last year, both of which were near his career-best marks. Though he rated as one of the game’s worst framers in 2016, he was one of the best in the season prior. Adam Lind, 1B/DH: From the same age bracket as Iannetta, Lind maintained his power (.192 ISO, 20 home runs in 430 plate appearances) last year with the Mariners, but posted an anemic .286 OBP. There were two main culprits: a .259 BABIP and 6.0% walk rate that represented nearly a 50% drop from his personal best (11.5% in 2015). While it’s unlikely that the left-handed slugger will again post such strong walk tallies, he ought to be able to rebound somewhat in that regard. And it’s reasonable, perhaps, to anticipate a bounceback in the BABIP department; Lind continued to make about as much hard contact as he did during his productive preceding seasons and maintained a fairly typical mix of grounders, liners, and flies. Logan Morrison, 1B/DH: As with Lind, Morrison represents a particularly intriguing target since the market was so saturated with defensively limited slugger types. The 29-year-old has never been a consistent producer, and seemed headed for an early end to his time with the Rays after an abysmal start to the 2016 season. But he rebounded beyond any expectations over his final 303 plate appearances, slashing .275/.350/.498 and driving 14 home runs in that half-season of work. While hitting to the pull side more than ever before in 2016 (an even 50%), Morrison made hard contact at a personal best rate of 34.2% and left the yard on 15.2% of his flyballs, the second-best mark of his career. His final numbers could look even better had he not ended up requiring wrist surgery in September. The injury risk may harm Morrison’s stock further, but it also increases the potential payoff. 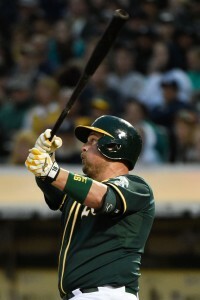 Billy Butler, DH: There isn’t much to love about Butler’s last three seasons, as he has been about a league-average overall hitter — well shy of what you’d hope for from a right-handed hitter who’s limited to DH duties. But he did show quite well in his brief stint at the end of 2016 with the Yankees and remains rather difficult to strike out (career 14.8% walk rate). Plus, Butler produced a strong 28.9% line-drive rate in 2016 while cutting back on an infield fly rate that had soared to 9.4% in 2015, perhaps suggesting he could turn back into a reasonably productive hitter — particularly given that he’s still just 30 years of age. Trevor Plouffe, 3B: There’s no denying that Plouffe was banged up in 2016, as he was shelved at various times by intercostal and oblique strains as well as a broken rib. He finished strong, posting a .277/.345/.465 slash over his last 113 trips to the plate, and carried a slightly above-average .248/.312/.426 batting line while swatting 74 long balls over his prior four seasons. While there isn’t much reason to expect that Plouffe will be a top-quality regular, he has every chance of returning to being a useful player: he’s just thirty years old and rated as an average-or-better third baseman in 2014-15. Luis Valbuena, 3B: The role of injuries is even more straightforward in Valbuena’s case, as he was humming along nicely (.260/.357/.459 with 13 home runs over 342 plate appearances) before he was cut down with a hamstring injury. Unlike Plouffe, he hits from the left side, enhancing his function. While the 31-year-old is not well-regarded with the glove, Valbuena can still play third base and has spent time in the middle infield as well (along with a brief foray into the corner outfield). Chris Coghlan, INF/OF: A left-handed hitter with some defensive versatility, Coghlan has provided the Cubs with over 1,000 plate appearances of .264/.351/.441 hitting and 26 home runs over the last three seasons. Of course, that output came on both sides of his ill-fated stint with the A’s, where he slashed an anemic .146/.215/.272 to start the 2016 campaign. The 31-year-old Coghlan typically receives good marks in the corner outfield, saw spot duty in center earlier in his career, and is at least serviceable enough at second and third to have been utilized at both spots in recent years. Desmond Jennings, OF: While things didn’t end well in Tampa Bay, Jennings is still just 30 years of age and isn’t far removed from being a solid, everyday player. He has plenty of experience in center field and has generally drawn strong reviews for his work in the corner outfield. Jennings has been beset by injuries over the last two years, and has been inconsistent at the plate even when healthy. But he managed a .150 ISO last year, even as his on-base numbers were doomed by a .243 BABIP, and could again be a solid asset if he can return to his career plate-discipline marks. Last year’s 9.3% walk rate matched his career numbers, though he jumped to a 25.8% strikeout rate in 2016 while posting a 12.0% swinging-strike rate that was about 50% higher than he had ever carried previously. Austin Jackson, OF: 2016 was supposed to provide a bounceback opportunity for AJax, who’ll soon turn 30, but a knee injury ended his year after just 203 largely uninspiring plate appearances with the White Sox. Jackson’s power has fallen off a cliff, and he wasn’t running as much even before the injury, but perhaps a lengthy respite can get the still-youthful player back in physical form. He was nearly a league-average hitter with solid glovework in center as recently as 2015, so perhaps his forgettable stint in Chicago is more a blip than the start of a full-scale falloff. Colby Rasmus, OF: Rasmus played well enough in 2015 to earn a qualifying offer after the season. His return to the Astros wasn’t nearly as productive, as he scuffled to a .206/.286/.355 batting line. But Rasmus was playing with a cyst in his ear, which was ultimately removed via surgery, and also underwent hip and core muscle procedures after the season, so perhaps injuries played a major role in his poor campaign. He also wasn’t helped by a .257 BABIP. Rasmus is still just 30 years of age and produced a strong .238/.314/.475 batting line with 25 dingers in 2015. There are other sources of potential value here, too: Rasmus has typically graded quite well on the bases, though he doesn’t attempt many steals, and metrics were quite pleased with his glovework in both the corner outfield and center in his most recent campaign. SEPT. 15: The Yankees have announced the signing of Butler to a Major League deal. Right-hander Nathan Eovaldi has been transferred to the 60-day disabled list to clear a spot on the 40-man roster. SEPT. 14: The Yankees have reached an agreement to sign recently released Athletics designated hitter/first baseman Billy Butler, reports Jon Heyman of FanRag Sports (via Twitter). Heyman further specifies that Butler has signed a Major League contract with New York. Specifics surrounding the deal aren’t known, but Butler can be had for nothing more than the pro-rated portion of the league minimum through season’s end following his release by Oakland. That means it’ll cost the Yanks about $50K to add Butler into the mix, presumably for the remainder of the 2016 campaign only. Butler, 30, signed a three-year, $30MM contract with the A’s prior to the 2015 season – a move that paid very little in the way of dividends for Oakland. The longtime Royals DH struggled in both seasons he spent wearing green and gold, hitting a collective .258/.325/.394. While that production graded out as roughly average when factoring in the Athletics’ cavernous home park (99 OPS+), a league-average bat at the DH slot (and occasionally at first base) isn’t a positive outcome on a $10MM annual investment. As Mike Axisa of River Avenue Blues points out (Twitter link), however, the Yankees started light-hitting backstop Austin Romine at designated hitter tonight against a left-handed pitcher. Butler could give the Yankees a solid, low-cost option against southpaws for the remainder of the season, and they’ll be facing no shortage of left-handed opponents; Ken Rosenthal of FOX Sports notes that the Yanks are slated to face lefties in seven of their next 11 games (Twitter link). That said, it should be noted that a large reason for the decline in performance from “Country Breakfast” is the fact that his numbers against lefties have plummeted in the past two seasons. Butler crushed lefties at a .314/.393/.519 clip from 2007-14 despite playing his home games at the pitcher-friendly Kauffman Stadium, but he’s managed only a woeful .226/.329/.358 line against lefties since signing in Oakland. Few would’ve thought that the Yankees would be in this position at the non-waiver trade deadline when they parted ways with Aroldis Chapman, Andrew Miller and Carlos Beltran in order to acquire prospects, but New York currently sits just two games back from an American League Wild Card spot. However, they just lost a right-handed option earlier today with the news that Aaron Judge has been placed on the disabled list due to an oblique strain, thinning out the club’s right-handed options at the plate. Of course, if the Yankees are able to close the two-game gap that currently faces them, Butler would be ineligible to join the postseason roster, having been added to the organization after the Aug. 31 postseason eligibility deadline. Sonny Gray threw 11 pitches off a mound in a short bullpen session on Sunday, and the A’s righty told the media (including MLB.com’s Michael Wagaman) that he is still hopeful of pitching again this season, even if it’s just a relief outing or two. Earlier reports this week suggested that Gray’s 2016 season was probably over, given the nature of his injury (a right forearm strain) and the fact that the A’s are well out of the pennant race. Tim Lincecum won’t pitch again for the Angels in 2016, but GM Billy Eppler tells John Shea of the San Francisco Chronicle that he’ll touch base with the righty in the offseason. In fact, Eppler said he has already “spoke at length with [Lincecum] about some thoughts for the wintertime and I’ll probably have more dialogue with him to see what he’s doing from a rehabilitation and strengthening standpoint.” Shea figures Lincecum will have to accept a minor league contract and be more open about converting to relief pitching if he hopes to continue his career. The Giants were interested in Lincecum as a reliever last winter, so a reunion could be possible if Lincecum indeed accepts a role change. While Lincecum struggled badly in limited duty with the Halos, Shea feels a proper offseason of conditioning and a full Spring Training could be greatly beneficial for the right-hander. The Athletics have released first/baseman designated hitter Billy Butler, according to Susan Slusser of the San Francisco Chronicle (Twitter link). Slusser reported Friday that Butler would not return to the A’s in 2017, so their decision to cut ties with him now isn’t a complete surprise. In a move that looked questionable at best from the get-go, low-payroll Oakland signed Butler to a three-year, $30MM contract in free agency after the 2014 season. The longtime Royal was coming off his worst season since 2008, having hit .271/.323/.379 with nine home runs in 603 plate appearances, and he wasn’t any better during his nearly two-year stint with the A’s. Butler, 30, combined to bat an underwhelming .258/.325/.394 with 19 homers in 843 trips to the plate with Oakland. Thanks to the package of below-average offense, defense and base running he provided to the A’s, Butler accounted for minus-1.2 fWAR with the club, tying him for the majors’ 18th-worst mark among position players since last season. In addition to his on-field difficulties with the A’s, Butler was involved in a clubhouse altercation with teammate Danny Valencia last month. The two engaged in a verbal dispute after Butler made comments that may have interfered with an endorsement deal for Valencia. It escalated to the point of physical contact before Valencia struck Butler with one or more punches. Butler reported being fine afterward, but he then began exhibiting nausea and vomiting. While the A’s fined the pair undisclosed amounts, general manager David Forst said Sunday that the confrontation didn’t factor into Butler’s release (Twitter link via Slusser). All told, Butler’s tenure in Oakland was an unmitigated disaster for a player who enjoyed a five-year stretch of solidly above-average offense with Kansas City from 2009-13. During that period, the 2004 first-round pick slashed a terrific .302/.372/.469 with 99 homers in 3,370 PAs. That half-decade showing ultimately led to his deal with the A’s, who will now eat the $10MM-plus remaining on his contract. Right-hander Sonny Gray is coming off the worst season of his career, and while that has his stock at a low point, Gray nonetheless tells Susan Slusser of the San Francisco Chronicle that he is open to a long-term deal and has made that known to the Athletics on multiple occasions. “The way this year went, you never know what would come out of that,” said Gray to Slusser. “On my side, obviously, I’d love for it to be brought up or whatnot. But that’s never been the case. And if it’s not here sometime, I don’t know that it’s worth doing.” Of course, while Gray’s negotiating power is at an all-time low at the moment — a potentially favorable time for the A’s to secure him — there’s also the possibility that the trapezius strain and forearm strain which have plagued him in 2016 will have lingering and/or compounding effects that lead to continued ineffectiveness. An All-Star and a Cy Young candidate in 2015, Gray struggled through a dismal 2016 campaign, twice landing on the disabled list and recording a 5.74 ERA with 7.2 K/9, 3.3 BB/9 and a 54.3 percent ground-ball rate. The strikeout and walk rates were the worst of the 26-year-old’s career (albeit just barely in the case of the strikeout rate), and Gray showed a marked increase in hard-hit balls and home runs against him. Gray yielded just 36 home runs through 491 frames in his first three big league seasons — an average of 0.66 homers per nine innings. This season, though, he allowed 50 percent of his previous career total (18) in just 116 innings of work — an average of 1.4 homers per nine. Gray’s home run spike occurred without a dramatic increase in his number of fly-balls allowed (indeed, his ground-ball rate was actually the second-best of his career), meaning he simply had an inordinately high number of his fly-balls leave the yard. While homer-to-flyball rate tends to fluctuate on a year-to-year basis, thus creating some hope that there’s an element of randomness to this season’s struggles, a look at Gray’s heatmaps from 2016 and 2015 (via Fangraphs) illustrates that he left a considerably larger number of fastballs out over the plate for opposing hitters this season. That slip in location — also evident in his elevated walk rate — wasn’t the sole cause of all of the homers he yielded but did lead to much better success against his fastball (.861 opponent OPS in 2016 compared to .753 in 2015). All of that could potentially be due to his injuries, but if there’s another factor at play (or if the A’s have trepidation his ability to return at full strength in 2017), the prospect of a long-term deal becomes considerably riskier. This offseason will mark Gray’s first trip through arbitration, and he can be controlled through the 2019 season via that process. As it stands, the Bo McKinnis client projects to hit the open market as he prepares to enter his age-30 season — an age at which many pitchers still fetch lucrative free-agent deals ranging between four and seven years of length. Signing a long-term pact with the A’s that buys out free agent years would mean forgoing that opportunity, though he’d be doing so in exchange for immediate financial security. From the Athletics’ vantage point, Slusser notes, there’s simply the matter of whether they could afford to lock Gray or any of their other key contributors up at all. (Slusser lists Stephen Vogt, Khris Davis and Marcus Semien as other potential candidates, though none of the bunch specifically discussed a willingness to sign in the manner that Gray did, hence the focus on him in this writing.) The A’s can ill afford to miss on long-term contracts, as their prospects for either securing a new stadium or moving to another city which affords the same opportunity aren’t encouraging at the moment. And, the upcoming wave of collective bargaining negotiations could impact league-wide revenue sharing, which could potentially bring a significant blow to the Athletics’ payroll capacity as well. The A’s have already whiffed on one large contract, as Billy Butler’s three-year, $30MM deal has looked regrettable from the get-go. Interestingly, Slusser writes that “[t]here is no chance” that Butler will be back in 2017, though the A’s aren’t likely to receive much in the way of salary relief even if they find a trade partner, as Butler has batted just .258/.325/.394 in his two seasons wearing green and gold. While payroll capacity will certainly be a factor in any potential extension talks with Gray, so too will the fact that there aren’t many comparables in recent years. Typically, starting pitchers that ink extensions do so earlier in their careers. Via MLBTR’s Extension Tracker, Lance Lynn and Wade Miley are the only two starters Gray’s service class that have signed contracts of three or more years in the past five years. Both pitchers signed away only three guaranteed years (their three arbitration years), though Miley’s deal does contain a club option for a fourth. Miley’s deal affords him a guaranteed $19.25MM, whereas Lynn’s three arbitration years went for $22MM. Either of those deals could serve as a theoretical blueprint for the arbitration years in an extension, but the difficulty the A’s will likely face would be finding an agreeable price for any free-agent years that an extension would cover. While Oakland would rightly bring up Gray’s lackluster performance and injuries in the 2016 season, his camp would almost certainly be looking more at Gray’s 2013-15 excellence when trying to establish a price point. Finding a balance between those two vantage points doesn’t figure to be an easy task. TODAY, 6:08pm: Butler will also receive a fine, GM David Forst told reporters including MLB.com’s Jane Lee (via Twitter). The veteran DH is headed to the 7-day concussion DL as well. 5:14pm: Valencia will be fined for his role in the ruckus, Slusser tweets. 4:04pm: Slusser now reports the full details of the altercation, which you can find here. In essence, it seems, both players engaged in a verbal dispute after Butler made comments that may have interfered with an endorsement deal for Valencia. It escalated to the point of physical contact before Valencia struck his teammate with one or more punches. While Butler initially reported being fine in the immediate aftermath of the dust-up, he began exhibiting nausea and vomiting thereafter. Neither player agreed to comment on the matter. Notably, Slusser adds, Valencia could end up being punished later today. She suggests that he could be suspended or even given his release. The team’s handling of the matter will certainly be closely watched, as it could impact Valencia’s future in the organization and availability to other teams — though clearly this incident hasn’t increased his appeal. The exact nature of the altercation isn’t known, though since Valencia played on Saturday, one could conclude that the A’s didn’t consider it major enough (at least not immediately) to warrant punishment. Valencia didn’t play on Sunday, though Slusser notes that could also have been a baseball decision given Valencia’s poor career numbers against White Sox starter Jose Quintana. Clubhouse issues have plagued Valencia in the past, which could in part be why he wasn’t dealt at the trade deadline when the A’s unloaded several other veterans. Valencia wasn’t even expected to get regular playing time as Oakland focused on younger players, though he has gotten the bulk of starts in right field in August since he is still swinging a solid bat. The veteran has 15 homers and a .302/.351/.478 slash line through 387 plate appearances this season, and is currently on a streak of two hits in each of his last six games. Valencia would seem to be a prime August trade candidate if he can clear waivers, though this latest incident isn’t likely to help his reputation around the game. The 31-year-old is eligible for arbitration this winter before hitting free agency after the 2017 season, and his good numbers will earn him a raise from his $3.15MM salary from 2016. It seems like the A’s will pursue a trade against this winter, and a non-tender could even potentially be in the cards (despite Valencia’s strong season) if the club wants to clear the roster for younger talent. Plenty of eyes will be on left-hander Rich Hill on Sunday as he makes what could be his final start with the Athletics, writes Susan Slusser of the San Francisco Chronicle. Scouts from a handful of playoff-contending clubs – the Red Sox, Rangers, Orioles, Marlins and Tigers – will be in attendance to observe Hill’s home outing against the Blue Jays. Hill, 36, has unexpectedly established himself as a hot commodity leading up to the Aug. 1 trade deadline since his torrid stretch as a member of the aforementioned BoSox last September. Dating back to that four-start run, the journeyman has performed like an ace over a 105-inning sample, having recorded a 2.06 ERA, 10.8 K/9, 2.83 BB/9, 49.6 percent ground-ball percentage and 17.9 percent infield fly rate. As a result, the A’s are hoping to land a haul similar to the one they received from Houston for southpaw Scott Kazmir last year (two prospects, right-hander Daniel Mengden and catcher Jacob Nottingham), according to Slusser, who notes that a Hill trade isn’t necessarily a sure bet. If the A’s can’t find a deal to their liking for Hill, they could retain him through the season and then tender the free agent-to-be a qualifying offer, which will be worth in the $17MM neighborhood. Should Hill accept, that would give him roughly $23MM over two years with the A’s (including $6MM this season), which, considering his performance, wouldn’t be an unreasonable cost for his services. However, the A’s are much less likely to keep Hill and qualify him than they are right fielder Josh Reddick, per Slusser. Reddick – another pending free agent – is drawing pre-deadline interest around the league, as Slusser reported last weekend, and he and the A’s are far apart on contract extension talks. In the event Oakland does shop one or both of Hill or Reddick, it won’t try to attach designated hitter Billy Butler and his contract to either, adds Slusser. The A’s are more worried about maximizing the return for their best trade assets than taking less just to throw Butler’s $15MM overboard. Since signing a three-year, $30MM deal with the A’s in November 2014, the ex-Royal has become an afterthought. In 163 plate appearances this season, the 30-year-old Butler has hit .253/.307/.380 with two home runs. His poor output could lead Oakland to eventually designate him for assignment, Slusser writes. Interestingly, third baseman Danny Valencia is another designation candidate, reports Slusser, even though he has batted a fantastic .295/.348/.507 with 30 home runs in 659 PAs going back to last year. Despite that production and his cheap team control through next season, Valencia is not garnering interest, relays Slusser. With the out-of-contention A’s looking to evaluate their younger talent, the 31-year-old Valencia could end up designated – as he was with the Royals last season – if Oakland can’t find a taker for him. Whether Valencia is open to positions other than third and how he handles a decrease in playing time might keep the A’s from giving him his walking papers, however, according to Slusser. Even with Jered Weaver and C.J. Wilson coming off the books next winter, Pedro Moura of the Los Angeles Times doesn’t expect the Angels to be huge spenders in the 2016-17 free agent market. Assuming the Halos don’t pass their high of $165MM on player payroll, they will only have around $40MM to spend on 16 roster spots. Brandon Belt’s five-year, $72.8MM extension with the Giants is “a reasonable common ground” between the two sides, Fangraphs’ Craig Edwards writes in an analysis of the contract. Belt may have sacrificed some extra money by not hitting free agency after the 2017 season, though since he’s had a bit of inconsistency in his career, landing a big nine-figure deal wasn’t a guarantee. (Edwards doesn’t mention Belt’s concussion history, which may have also played a factor in his taking a big payday now.) Edwards also notes that Belt is just the third player in the last three years to sign an extension two years away from free agency, along with teammate Brandon Crawford and the Marlins’ Giancarlo Stanton. In an interview on MLB Network Radio on Sirius XM (Twitter link), Athletics manager Bob Melvin implied that Billy Butler will indeed be a part-time player for the club, saying that “for the most part he’s gonna be playing against lefties.” The veteran slugger has “been great about” accepting the reduced role. Obviously, neither Butler or the A’s have to be happy that it has come to this, given the three-year, $30MM deal Butler signed prior to the 2015 season. Butler has been the least-valuable player in baseball as per the fWAR metric since the start of the 2014 season, as he provides no defensive value as a full-time DH and his once-fearsome bat has badly declined. Athletics majority owner John Fisher is taking a larger role in the club’s quest for a new ballpark, Phil Matier and Andy Ross of the San Francisco Chronicle report. Fisher appears to be interested in a downtown Oakland location for a new stadium, possibly a site near Laney College if the team can purchase the land. Since purchasing the A’s with Lew Wolff in 2005, Fisher has largely been publicly silent on team matters, with Wolff taking a more visible role as the Athletics’ managing partner.